Traveler at Sea: Fly North! There is no signal up here in the pine woods of Kaibab National Forest. No signal on the phone. No signal for internet. But there is a small chipmunk playing in the cold fire pit and it is 70 degrees in the cabin of the LRV. I’m sitting at the dinette table in our little Dolphin RV. 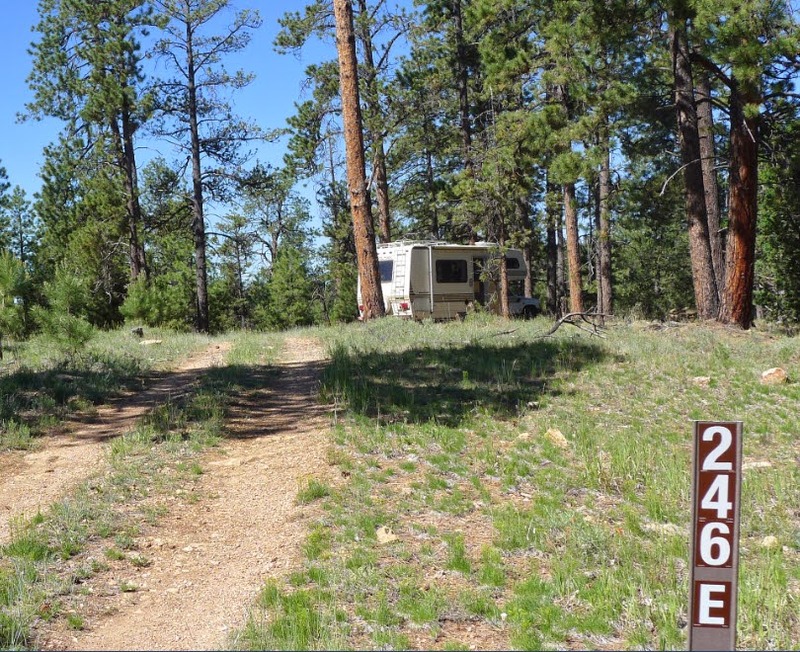 This is the “land” RV as opposed to the “water” RV which is Traveler. She’s 800 miles away south of here and 8000 feet in elevation below us, all covered with tarps, her thru hull valves shut, her water tanks clean and empty. We have abandoned our Traveler, fleeing to higher elevations and the coolness that comes with it. 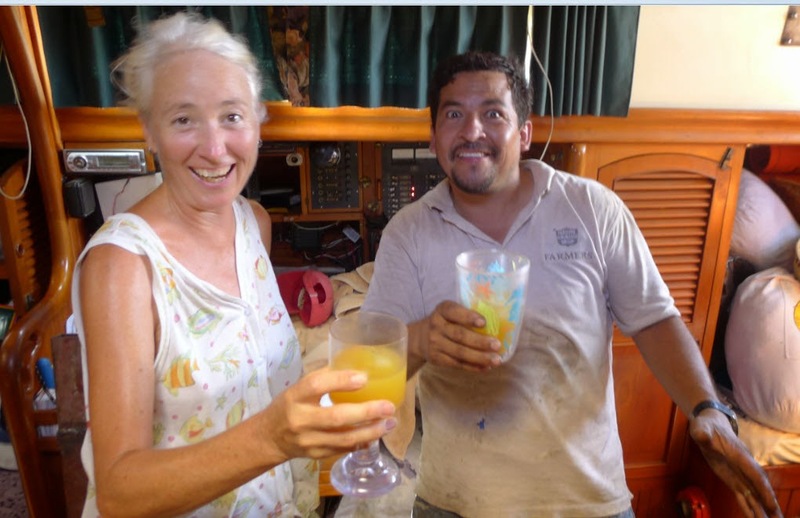 Connie and Omar, celebrating the removal of the Perkins engine. We were on the hard for two weeks prepping the boat, removing the broken Perkins 4-108, and arranging for a new Beta engine to be shipped from England. We found Omar Garza to help us with the engine. He'll be there when it arrives from England and can install it for us while we are visiting the northwest. By the time we arrived in Guaymas we’d been in the oven that is late spring Baja for about 10 days. We’ve learned our limits as to how much heat we can take. My comfort level for sleeping is set at about 85 degrees. We’d not seen 85 degrees for more than two weeks and we were not only dehydrated but cranky from lack of sleep. I’d wander around the boat in the middle of the night with the temperature gun in my hand shooting the laser pointer at things and remarking, “95 degrees on the cabin floor” or “90 degrees on deck”. Connie and I stopped sleeping together because our combined body heat only made the bed hotter. We drank water by the gallons, amazed at how fast the 5 gallon carboy emptied itself. And we became more stupid every day. Connie stopped playing music because it was too hard. We’d wander around in a daze, resting often, taking twice as long to complete tasks as normal. Finally, after getting somewhat finished with the necessary paperwork on the new engine we decided we could leave. Our to-do list was short. We’d leave on Wednesday. The last few items were tough. In cooler temps they’d be a breeze but in the heat every task seemed insurmountable. I sat on the floor removing the inspection ports on the two stainless steel water tanks. Each port has 16 bolts. Four ports means 64 bolts to remove. It took forever. Exhausted, I went up top to tell Connie that I’d finished, hoping that she’d take over and start cleaning out the tanks. She did and emerged an hour later soaked in sweat, her joints creaking, her muscles bruised from the contortions necessary to reach every surface of the two 75 gallon tanks. I went below and installed the covers, tightening the 64 bolts one at a time, emerging covered in sweat, stiff and sore from crouching on the floor. The final item was to tarp the boat. 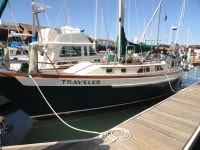 We covered the teak decks with various tarps and tied them low down on the stanchions. Connie wrapped the lower part of the mast with another tarp to keep the ultraviolet rays off the coiled lines. 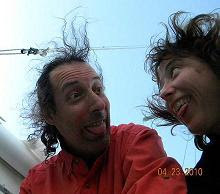 We stumbled around, argued, cut small pieces of line, and finished with the tarps by sundown before climbing down the ladder to hide from the mosquitos in the hot LRV. Cooking was out of the question, it created too much heat. The next morning we grabbed a few more items off the WRV, jumped into the LRV and headed north. It was already 95 degrees in the cabin of the pickup truck. The land gradually rises on the road from Guaymas to Nogales. We paused just south of the border to take stock of our supplies, looking for fruits, vegetables, and meats that could not cross into the U.S. Connie boiled the potatoes and beets and we cooked the little bit of raw meat we had in the freezer. We were searched, as always, at the U.S. customs and came away without a problem. By late afternoon we were in Nogales, Arizona pigging out at an all-you-can-eat Chinese restaurant. By nightfall we were in the Walmart parking lot luxuriating in the 75 degree evening. Ahhhhhhh..75 degrees, Isn’t it just wonderful? Thursday, early, we drove into Phoenix and the air conditioned apartment of Connie’s sister Diane. I sat on the couch with the computer on my lap and Connie made shell wind chimes and jewelry with 6 year old Ava, her grandniece. Friday we drove out of the 100 degree city and made our way up to the high elevation town of Flagstaff. 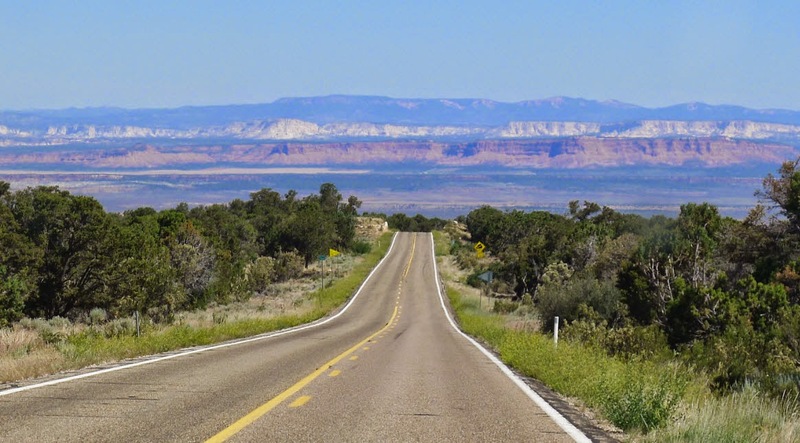 Friday we braved the desert again heading north as always and found a forest service road up in the Kaibab, north of the north rim of the Grand Canyon. We camped in the pines, experiencing a cool night under blankets, stars overhead, and complete silence. After visiting the north rim we found another isolated spot in the Kaibab and here I sit, full of pancakes, watching a chipmunk digging in the dirt. Lesson learned: When it gets too hot, go someplace else. Coming down out of the national forest. Grand Staircase Escalante in the distance. On entering the states Connie reminded me to stop before turning right on red. We don’t do that in Mexico, we just look and go. In the states you don’t have to bring your own toilet paper into the bano. In Mexico they pump the gas for you. Mostly, not so in the states, and there are no kids waiting to wash your windows for a couple of pesos. In Mexico you greet everyone you meet. In the states people look aside or down at their feet, or they get that tight-lipped, almost smile on their face as a slight acknowledgement of your presence but a warning to not presume conversation. We’ll come down out of the Kaibab this morning and try to find internet so I can check to see if we need to be in Seattle by the first. I’ve got job prospects there. Maybe we can do some work and make enough cash to reimburse the cruising kitty for the 9k we just sent off to the U.K. In the meantime, it feels great to be wandering the back roads, taking our time, living cheap, and experiencing that delicious feeling of slipping on a fleece sweater when the sun goes down. 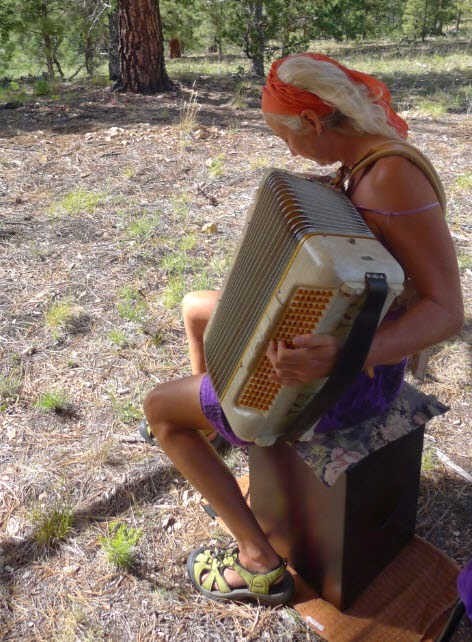 Best of all, Connie has started playing music again. What a wild trip! Happy your heading in our direction and hope to see you! Love to you both. Leave Puerto Escondido, No really, just leave it!